On the NG the Forward Aisle Stand held the Lower DU between the FMCs, but on the MAX the DU has been integrated into the large format displays. 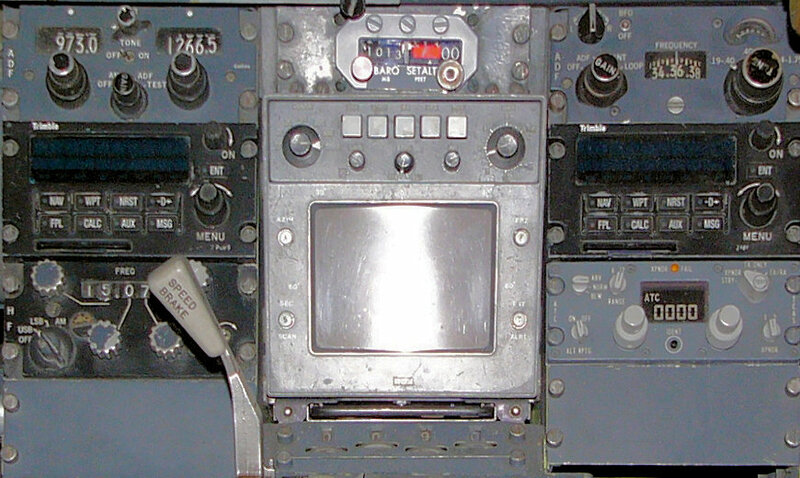 The space is now occupied by the controls that were previously located on the Center Forward Panel. 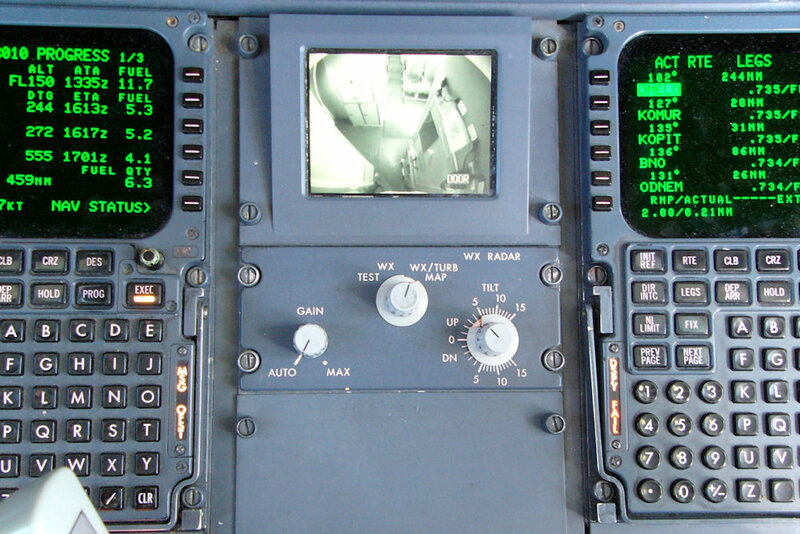 New to the MAX are the two interactive display selectors, these allow pilots and engineers to interact with the MFDs. They have inner and out rotating selectors and a push button switch which are used to scroll through, highlight and select different fields on the displays. Think of these selectors as computer mice. 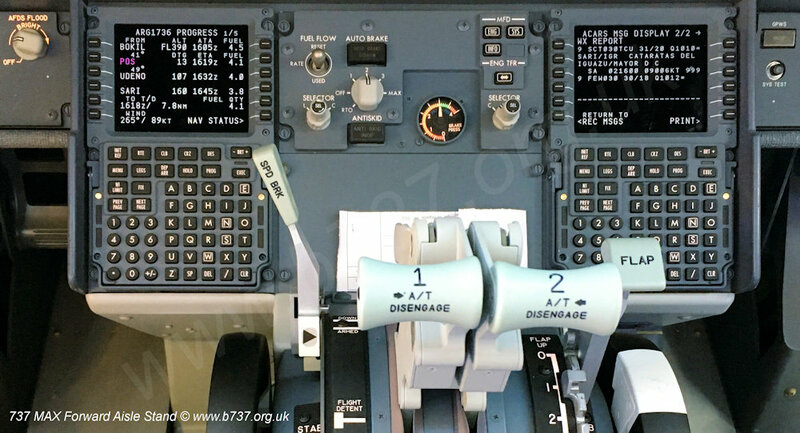 I hope that the next generation of 737 rendered these selectors redundant with touch screen displays! There is a customer option (not shown here) for Brake Temperature and Tire Pressure Monitoring Systems. Aircraft with this option have amber "BRAKE TEMP" and "TIRE PRESSURE" captions above the brake pressure gauge. This is why the lightplate leaves a large gap about the brake pressure gauge. The MFD C/R pushbutton, to cancel and recall autoland advisory messages, is only installed on aircraft with fail-operational autoland. On the 737-3/4/500 series there were various customer options for this panel. This aircraft had weather radar controls and door viewer screens. 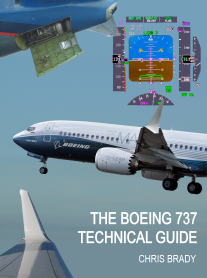 On the 737-1/200 the forward aisle stand was called the Forward Electronic Panel and was an extension of the aft electronic panel commonly housing the ADF, weather radar, transponder and FMC if installed.